Breast Health Formula: Now more than ever before, women are being proactive about supporting breast health. One of the most important actions you can take is to maintain a healthy balance between “good” and “bad” estrogen. 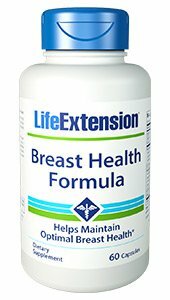 So if you’d like to proactively restore your youthful hormonal balance, try Breast Health Formula. This broad-spectrum formula provides powerful nutrients that help support healthy estrogen activity and detoxification to preserve optimal breast health. Detrimental factors like the ageing process, along with the daily bombardment of damaging environmental estrogen-like compounds, can affect the cellular structure of a woman’s breast. Estrogen is broken down to several important metabolites in the body including the good 2-hydroxyestrone and the bad16 alpha-hydroxyestrone. Scientists have identified nutrients like indole-3-carbinol (I3C) that can tip the delicate balance of estrogens in favour of the good form.